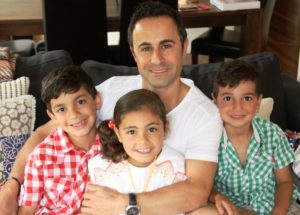 I am 45 years old and a divorced but devoted father of three wonderful children under 10 years of age – Adam (10), Olivia (9) and Luke (7). On the afternoon of Tuesday 14 June 2015, I was medically diagnosed with Stage 3b lung cancer. I have never smoked and have been in the best physical shape of my life. This is my story. For around 5-6 weeks prior to my diagnosis I had an annoying dry cough and like most people, I went to see my local GP (who I have seen for many years and who knows my medical history) to seek her guidance for prescribing me some medication to alleviate it. After various failed antibiotic attempts to clear the cough, I had a chest X-ray which in turn, resulted in a CT scan which identified some anomalies in my lungs. The CT scan was inconclusive so I was forced to have lung biopsy which ultimately concluded I had non-small cell lung cancer, with an EGFR mutation. The possibility of being told you have cancer is something we have all thought about in our lives but to actually receive this news is a terrifying experience. For me personally I recall the moment and perversely I felt a sense of relief that I knew what I was dealing with, despite being told the day before a long planned holiday to Bali with my family. But of course after that very brief sense of relief passed, the reality of my situation hit home … and it hit home very hard! A lung cancer diagnosis is very scary to start with and then being told, following a PET scan, that the cancer has spread beyond the primary left lung location, is simply devastating. There is no cure and the treatment is to control the cancer and have a quality of life while digesting the very harsh reality that statistically there was an 85% chance I might be dead within 5 years of my diagnosis. Ironically, I am in the best shape of my life – physically and mentally. I never ask about the prognosis because it is hard enough dealing with the fact that I have a deadly illness. Having a medically trained oncologist – who is not God, and cannot predict the future or my destiny – simply tell me about the devastating statistics around survival was something I didn’t want to know – there was plenty of that readily available from Doctor Google!!! As an individual who always looks at the positive side of life, my overwhelming personal goal is not to be a statistic and to get through this so that I can be a father to guide my children, be a son, be a brother, be a friend and live a normal life like everyone else. I deserve that and so do my children, whose names are tattooed to my arm and remind me every day that they are my greatest source of strength, motivation and inspiration to survive and thrive. Equally I am also a very realistic man and accept there are some things I can control and some I cannot. I can control my mind (at least I try my best to) and can control the food I eat. However, I cannot control what is going on internally within my body or how my body or cells react to certain medications and therefore I have to put some faith in the wonders of modern medicine and research to hope my medication continues to work and when it doesn’t (which is starting to happen now) that I have other options. There are new medications that I may be able to access to keep me alive. Of course I also put my faith in God and pray that he has simply given me another life challenge to face. I’ve overcome those challenges so far albeit with some well-deserved battle scars. I read somewhere that “Cancer is simply a word not a sentence”. That is so true and in fact if you break the word down even further you can interpose other words that make it become something positive; such as “can-cer-vive” … so I have high hopes to survive and live with this illness. Ultimately, it would be wonderful to see lung cancer and all cancers become chronic illnesses rather than terminal ones. I am very conscious of the emotional cancer that comes with a biological diagnosis. The emotional cancer can be quite extreme and wide, from the common negative perception of cancer, to family and/or friends’ reaction and engagement. As a cancer patient, we do not need pity. Instead we need positive energy and acceptance that we are still the same human being we were prior to receiving a terrible and unwelcome diagnosis. As a single man I am also dating and I’ve experienced the best and worst in people. The worst is a lady who, when told her I am living with a life threatening illness, stepped back defensively and said “Ummm, so why are you out with me?, you are terminal, everyone dies of cancer !” or another person I met when I told him I was dealing with the illness calmly asked “oh really, so what did they give you, 12, 18months?”. These unfortunate encounters that cancer patients, who are normal people given terrible news, sometimes face. I stand tall and don’t let that unwelcome insensitivity drag me down. In fact I often gain strength from it and don’t fear what I have. Fear drives negative emotions and as each day passes that I live with this illness I gain strength and confidence that I can be fearless against it. Having managed the stress of two failed marriages over a 12 year period, and retained a high pressured global corporate finance role, I thought I was tough and could handle anything that came my way. Even today I still look at life with a glasses half full mentality and draw strength and positive energy from my marital breakdowns – they taught me valuable life lessons and helped me personally become a stronger and more resilient and assertive man. It is this resilience that has enabled me, after a period of time, to accept my diagnosis with dignity and single minded conviction and passion that I will live on with the condition – albeit that I expect to experience some hurdles along the way. So I don’t take things too seriously anymore and for those people who are negative or make me feel uncomfortable, I’ve become more ruthless and disconnect from them. We all know we are going to die at some stage, but thankfully we don’t live everyday thinking about it – it’s a blessing we are not programmed to think about the fact that one day we will die. However, for people who have a life threatening illness, we are forced to face the reality of our mortality – often each and every day – most of us who are normally very positive people, remain positive and continue living a good life, however there is no denying that it can be incredibly hard to stay that way all the time. In those “down” moments, I’ve learnt just to let the emotions pour out rather than bottle them up. I won’t let my condition define me or to be honest I try not to let it define me. However it is hard not to feel different. I am living with an illness that most of the population do not have and I am battling a large cloud of harsh statistics that say it is going to kill me. When in a crowd, I often look around at people enjoying life and I sometimes cannot help but think “you don’t have what I have”, “you don’t know how lucky you are”. I accept that I can’t simply live the way I used to, carefree and at times reckless, being a single, sociable man. I actively recognise I need to take care of myself and accept that I can’t do the impulsive things I used to do and which others so flippantly do, such as random late nights out (not that I did a lot of that). I’ve learnt rest and relaxation are powerfully healing on my body and mind. There is not one time after a great night’s sleep that I woke up feeling bad. I am thankful for each day and appreciate that the body is powerful at healing itself. I’ve become more philosophical about life and accept that sometimes things happen that simply make no sense. Life is so beautiful, precious and sadly can be painfully brutal at the same time, reinforcing a personal favourite saying which is “we are here for a good time, not a long time”. While one person is rejoicing or celebrating a successful moment in life, there is someone else in the world dealing with a life threatening illness or worse – has died prematurely. Focussing on the present has also been an important way of managing my illness and not thinking too far ahead. In this regard, I have to mention a wonderful quote from the 6th Century spiritual leader, Gautama Buddha, who said “the past is already gone, the future is not yet here. There is only one moment for you to live, and that is the present moment”. Wonderfully inspiring and practical words, however to be honest, for me personally they take some time to apply because my entire life and professional career has been focussed on strategizing for the future – what I want to achieve and where I want to be. A year on after my diagnosis, I don’t lose sleep over my condition and thankfully the pains I feel on a daily basis are bearable and don’t negatively impact on my quality of sleep or my overall quality of life. I’ve developed a sleeping strategy that involves me taking my mind to another place, another world in fact, often involving fun times with my children, in which I am not dealing with a serious illness. Life can feel normal and you can live a quality life even with a serious illness. I gain much strength and positive attitude from staying connected with other cancer patients. I have met some incredibly inspirational people in both Australia and overseas. In May 2016, I attended a national USA lung cancer summit (“HOPE”) run by a wonderful organisation called Lungevity in Washington D.C – where I met many patients of varied ages. We have an invisible bond, a brother/sisterhood, and we just know how to make each other feel good about life. We all definitely have in common a passionate commitment to paying more attention to the simple things in life that ultimately matter most … love, compassion, a sense of belonging, breathing fresh air and family. Story as told to Lung Foundation Australia in 2016.